On May 16th, Bernie Sanders introduced legislation to Congress to make all public colleges and universities tuition-free. This is a welcome measure, but it has zero chance of passing through the Senate or the House, let alone both if there is no movement to force it through. Higher education has become too corporatized and most of our politicians, Democrat and Republican alike, are bought out by big business and do not share our interest in changing that. But, how could we win tuition-free public colleges and universities? Let’s look at how they did it in Chile. Left over from the far-right dictatorship of Augusto Pinochet in the 70’s and 80’s, Chile had the most expensive education system in the world. Not unlike here in the U.S. Many students couldn’t afford to go to college and those who did often struggled to pay off their debt. But starting next March, coming off the back of an increase in corporate taxes that will generate $8.2 billion, all higher education in Chile will be tuition-free. This did not come from politicians with good morals, but rather from a mass movement against unaffordable education. In 2011 students built the movement with an eight-month long occupation of 100 campuses across the country followed by a sustained three-year protest movement with at its peak, an involvement of 800,000 students demanding free higher education. We must draw inspiration from the struggle in Chile, and follow their lead. He’s right. Progressive change has never started in the chambers of Congress or in the oval office. Change starts in the streets when the people demand it. If we want free college tuition, we need to build a movement. We need a nationwide, grassroots movement of students and workers united in taking on our “representatives” and their corporate donors through mass action to achieve our goals. As a student, I say what better time than now? 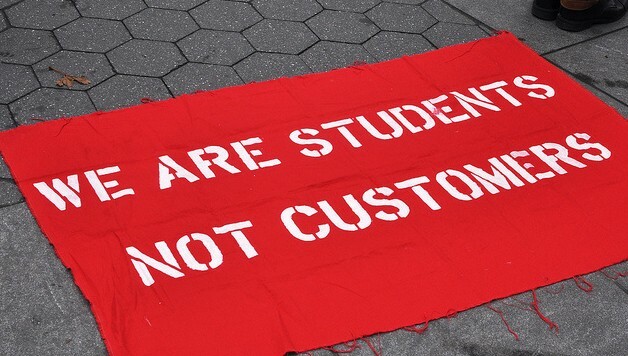 Let’s march on Washington and demand free public higher education and a cancellation of all student debt. Total student debt in America right now is well over $1.2 trillion and 58% of this is held by the poorest 25% of Americans. The college class of 2015 has an average debt burden of $35,051 per student, the highest of any graduating class in U.S. history. More and more economists are predicting that the student debt bubble will be the cause of the next market crash, and most of us don’t need to be reminded that the last market crash was just 7 years ago, and we have yet to see a full recovery for the majority of working people. Most egregious is the fact that the government is actually subsidizing the profits of private lenders like Sallie Mae. 83% of student loans are federal loans and in 2013 Congress passed a 21% increase for undergraduate federal student loans. Now is the time to rebuild the student movement. We students graduate college drowning in debt and there aren’t enough jobs in our fields of study. We can’t afford to wait. As students, we need to join the fight for a $15/hour minimum wage, continue our involvement in the Black Lives Matter movement, keep fighting rampant sexism and gender-based abuse, on our campuses and in our communities. Key to the success of our movements is connecting these struggles with an overall challenge to the exploitative system we live under, capitalism. Bernie Sanders calls for a political revolution, and I say: Let’s make it a reality. Let’s build a nationally organized mass movement for affordable higher education, starting with a million student march on Washington this fall. In solidarity with the labor movement, student power has accomplished amazing things in the past. Let’s bring it back.